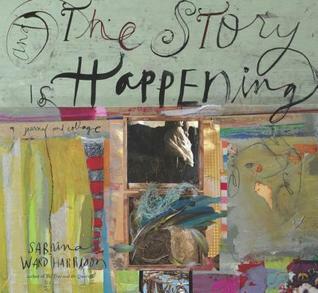 Sabrina Ward Harrison’s breathtakingly beautiful visual journal, And The Story is Happening, is her long awaited return to the publishing world (her last journal was published in 2005). If you don’t know who Sabrina Ward Harrison is, you must look her up. Her bright and moving mixed media artwork and photographs are deeply personal and out of this world. She can make the ordinary into the extraordinary. I still remember the first time I discovered her work, while I was working at Barnes and Noble. While tidying up shelves before closing, I came across her book Brave On The Rocks and it was love at first sight. At the time, I was an art student in college and her books inspired my own work and in some instances my life. I am and forever will be a huge fan and I encourage everyone to discover her books and her work! This isn't going to be most people's cup of tea, but I love this. Sabrina Ward Harrison is sharing her raw truth in images and words. There isn't any "How I Found My Creativity in 8 Easy Steps!" nonsense in here. Just simple, true expression. I wish there were more books that fall into this genre - instead of telling people how to be creative, there are just simple expressions of authentic creativity. Not as good as her previous books, in my opinion. Recycles many of the main ideas from her other works without many fresh ideas. Also, I was annoyed by the fact that many of the pages are just blown up portions of images from other pages. It kind of reminded me of those TV documentaries where they don't have enough visual content so they keep zooming in on the same images they've shown previously, or showing the same photos from new angles. A lovely looking book - pages of painted backgrounds and photos and SWH's signature (and oft-copied) lettering - but empty of any real content. The book includes a cute envelope full of paper pieces to use as collage in the book, thus if you are looking for a fun scrapbook to play around in - this is your book. If you were hoping for another Spilling Open - with both eye-candy and insightful writing, this is not that. Not a novel to be read, but an interactive journal/collage to make your own. Beautiful but not what I expected after Spilling Open. I craved more words.